Hoteliers: Don’t get MAD…get LISTED! 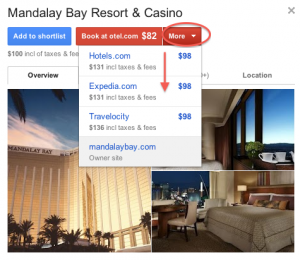 Some Hoteliers tell us that they’re mad at Google…Why? Independent hoteliers in particular complain that Google is taking their hotels intellectual property info (name & location) and allowing the OTA’s to bid on it, putting money in both Google and the OTA’s pocket. We understand this can be seen as a problem, but the truth is…Don’t get mad at Google – get LISTED by adding your real-time rates & inventory on Google Hotel Price Ads and proactively level the playing field. Let’s face it, getting customers is a game, or perhaps more of a war – a bidding war. What your distribution partners don’t want you to know is that there are independent companies like ours that allow you to get listed alongside the OTA’s who are bidding on your hotel name – thus leveling the playing field and giving the consumer a choice whether to book direct with you, or through one of your partner sites. The OTAs aren’t evil; they are an important marketing and distribution partner with the ability to get customers interested in your hotel, especially in the case when a customer didn’t already know your property exists. This “billboard effect” is a top benefit of working with OTAs (as well as the reason for their high margins). Online Travel Agencies and travel marketing sites spend millions of dollars a year on marketing their sites and understand that new customers may see your hotel on their website, yet contact your hotel and book-direct. We suggest that our hotel customers continue their OTA relationships as well as grow them as part of a multi-tiered distribution strategy, but the problem comes when the waters get muddied. Let’s say your customer, is searching for your hotel using your name in a Google search and the OTAs are bidding on your name via Google’s new Hotel Price Ads network or an AdWords campaign. 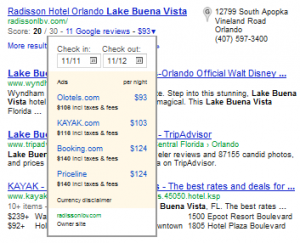 If you aren’t participating in these programs, you may be lucky enough to have an organic listing appear below the fold, but the bottom line is, if your hotel isn’t listed on the first page, and near the top of a relevant search, you’ve just steered your customer away from you and to your OTA partners. How do you combat this? It’s simple, get in the game! We all know the saying, “If you can’t beat them, join them”, the same is true with internet marketing. Unfortunately, you need to spend a little to drive your customers to your site, there are no free rides, or at least that’s what my parents always said. Being listed as a “free” link at the bottom of the hotel price ads drop-down on Google is great, but Google’s smart, they know that most users won’t click on a link where the price is not shown. If you put your Googler goggles on and look at these choices, does your eye even see the hotel link at the bottom? We as hoteliers may see the “owners site” link without pricing at the bottom, because we are trained to look for it…but if you are Joe Public, you barely will see it. If you do, you may not click on it because it doesn’t show a price, and we know most consumers are skeptics, they think if you aren’t showing your price, then you’ve got something to hide. Others think, and unfortunately they’ve been conditioned to believe, there is some magical deal somewhere on another site and that the “official hotel rate” on owner’s site is always going to be higher than what they can find elsewhere – which is why users generally check 8-12 or more sites before booking. If you look at it this way, Google has actually given the user a very useful tool by putting booking choices and links to each website with real-time pricing choices in their direct search path. Only time will tell whether or not the number of sites one visits before booking their trip actually goes down as customers start to rely more on Google’s hotel price search tools. We are hopeful that we’ll see more concrete data in the not too distant future to this regard, since in addition to the U.S., Google has already rolled this program out to much of the world, including the U.K., most of Western Europe, India, New Zealand and a few others. We anticipate the hotels that exploit their use of these tools by participating on Google’s Hotel Finder, can expect a notable increase in their book-direct customer base over the next few years. contact a Woodcrick Representative today.